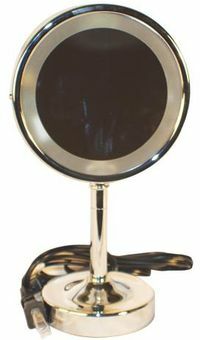 The VANITY MIRROR HIDDEN CAMERA is watching more than make-up applications these days. The wireless Vanity Mirror Hidden Camera is perfect for a bedroom. Features on/off switch in the power cord which powers the camera on or off and a two-sided mirror with normal and 5X magnification. Dimensions: 11.5" Tall, mirror has a 6" diameter.